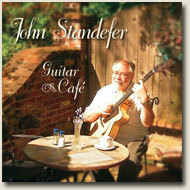 In this recording John explores beautiful melodies from around the world. There are swing tunes, ballads, South American classics, Chet Atkins style tunes, a European waltz, a Hawaiian piece, a hymn and a new original piece from John. Although John has been developing these arrangements for quite some time, the addition of the new Eastman Pagelli archtop guitar to John's arsenal was the spark that really brought it all together. Remarkably, in fact, John doesn't use his trusted Larrivee at all on this recording. Instead, the Pagelli and his McGill nylon and resonator guitars are the stars of the show.